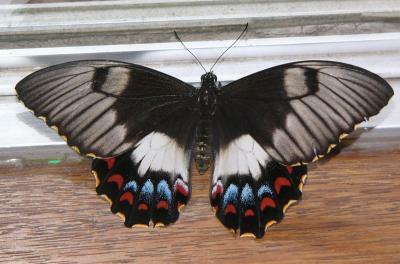 In October, I caught the orchard swallowtail. I found it in the bush near our house. It is the biggest butterfly found around Sydney. It has a 11cm wingspan. It likes to feed on citrus plants, so if you looked at your orange or lemon tree you might find a pupa. The pupa will be green if it is attached to a green leaf or stem, and will be brown if it is attached to a brown stem or leaf. The caterpillar is green with three white and brown bands. I like the colouring on the wings! !